Oakland Raiders player Donald Penn and his wife, Dominique hosted a one day football and cheer camp at St. Bernard High School on Sunday July 17. 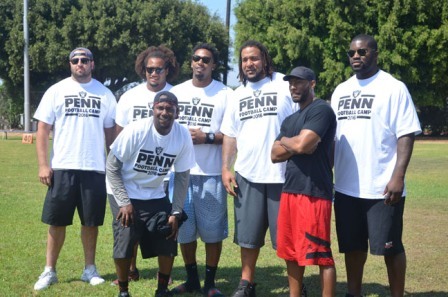 This year marks the fifth year of the Donald Penn Football camp while the Cheer Camp is in its second year. Children from the ages of four through 18 years old arrived to enjoy a day of drills and choreography. Each child that participated in the camp received free shirts and lunch. Fellow Oakland Raiders and other NFL athletes helped facilitate drills. Children in the football camp worked on footwork, passing, receiving, and blocking. During the drills, the pros would praise and critique the kids. Raiders defensive back Sean Smith, a Pasadena native, mentioned how this was the first camp he attended in the Los Angeles area. “I had the wide receivers and [defensive backs] so we did some feetwork, some technique and some one-on-ones at the end.” Smith said. Among the pros was Los Angeles native Daniel Munyer, who attended Notre Dame High School and played for Colorado. He is an offensive lineman for the Kansas City Chiefs. Participants of the cheer camp learned two cheers and one dance routine, two members of the Lakers Girls dance team were in attendance. The cheer camp performed their cheers and dance routine at the end of the day in front the football camp and parents. Participants of the football camp also engaged in a 7-on-7 scrimmages. St Bernard’s football players Raymond Ramos, Elias Armstrong and Lashad Cranfield also attended the camp. “It’s really important for the kids to come out and get that extra teaching, that extra tutelage that they need,” said St. Bernard Football head coach Jimmie Irby. Los Angeles native Nelson Sawyer brought his 12-year-old son to the camp, he was appreciative of Penn for hosting the event.